While leading heat-stricken and water-deprived Roman soldiers through the scorching desert to fight back against the Berber hordes, Quinlan uncovers a grave scheme that has the potential to obliterate his troops entirely. In this issue, Master Quinlan has fought with the Roman army against Berbers for five years. His commander is Tacitus, and Quinlan is his most trusted centurion. He would gladly die for him…if he could die. And though he is in the Roman army, he not fighting for Rome, who has not always treated him well, but for himself, a free man. More so, six years ago he learned through the other ancient ones like the Master that they needed him to learn so they could determine if he would be their ally, or must be destroyed. Thinking the Master had more to worry about than searching for him, Quinlan is told to lead some men to a pass to cut off a Berber army, while his commander would lead the rest to surprise the enemy. Quinlan would find more than Berbers though. 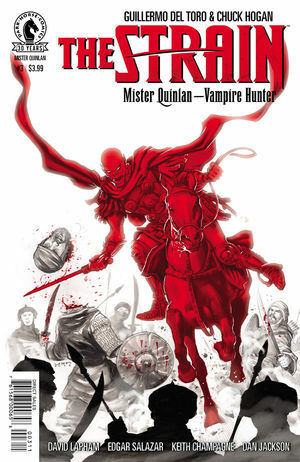 This is well written, keeping to historical accuracy, while giving us more insight to Quinlan and his past.